Tate Britain presents up to five exhibitions each year in contemporary British Art, called Art Now. You can access their current show, Colliding Imagery by Alan Michael, as well as past projects. Vanity Fair has posted a slide show of great images from their magazine. See us at our best, and our worst, as portrayed by some of our finest contemporary photographers. Formerly called the Santa Fe Center for Photography, it has now been reinvented as Center, a nonprofit organization that aims to nourish gifted and passionate photographers. Leigh Anne Langwell of Albuquerque, New Mexico, is the winner of their 2007 Santa Fe Prize for photography. Her photographs/installations are stunning. Jason de Caires Taylor has received some notice as the creator of the world's first underwater sculpture garden. He uses sculpture to create artificial reefs located in clear, shallow waters so that they can be seen by divers, snorkelers, and glass-bottom boats. Taylor's fascination is with natural processes combining ecology and art. Utilizing her background in areas like mycology and microbiology, Rachel Sussman is engaged in an effort to record the oldest living organisms on the planet. Traveling world-wide and consulting with leading biologists, Sussman is searching for examples of life that are at least 2000 years old. She has so far photographed over 30 different specimens, with the oldest being half a million years in age. Read about her at asci, which was founded in 1988 as Art and Science Collaborations. Established by Cynthia Panucci, ASCI presents a densely informative monthly bulletin, public panels, and symposia. You probably know sculptor Arthur Ganson as the inventor of the children's toy Toobers and Zots. Ganson has been fascinated by how things move since he was a youngster. His talk on moving sculpture at TED's website is well worth hearing. You can also see more of his pieces at aganson. Have you ever wondered what goes on inside of a hard drive? Here's a quick Youtube video that shows you exactly what is happening as you cut and paste, power up and power down. harddrive. Deborah Mills Thackrey is a visual artist who uses photography to move beyond its traditional borders. Her interests range from body paint to urban graffiti to eerie portraits. 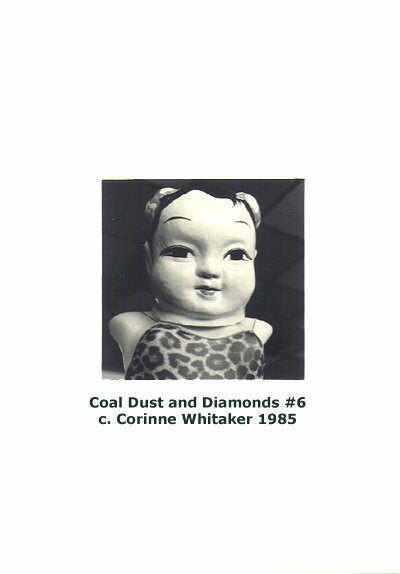 You might compare the image above to one I did years ago in a series called Coal Dust and Diamonds.